Shown with Model: 11-1243 horn button and Model: 10-5506 hub (both sold separately). Geunine Wood top grip with billet finger grips. Grip can be removed and custom painted to match your vehicle interior perfectly. 9-bolt mounting pattern, can be used with any GT9 installation hubs and GT9 horn buttons. This 9-bolt mounting pattern is interchangeable with any standard 9-bolt hub or horn button. 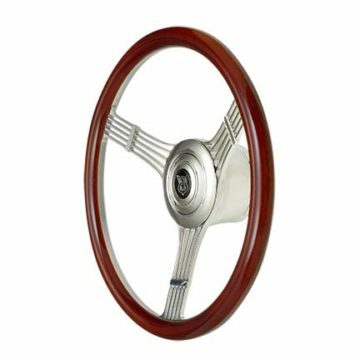 Click images below to view selection of horn buttons and installation hubs that fit this wheel.